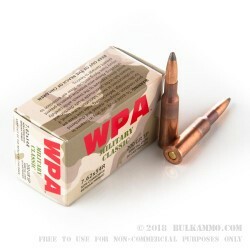 WOLF Performance Ammunition’s Military Classic line of ammunition features a distinctively Russian Berdan primed steel casing, which is coated with a special polymer to protect it against corrosion as well as facilitate in feeding and ejection. Its casing makes this round unsuited for work at a reloading bench, but steel’s far lower production cost than that of brass is very pleasingly reflected in this round’s price tag. Had you never intended to handload anyway, you’re certain to find a lot of value in this round. 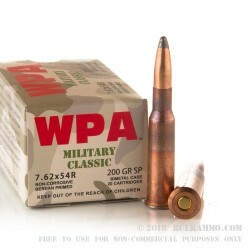 This 7.62×54mmR cartridge sports a 200 grain projectile. 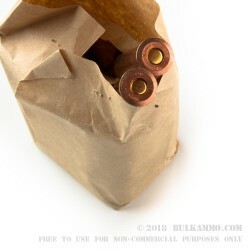 The soft point bullet’s core is exposed by its jacket at its tip, so it will expand to significantly greater than the bullet’s original diameter upon impact with a soft target. That makes this round ideal for hunting where hollow point bullets are banned, as they will still deliver somewhat similar terminal performance.